It appears to me of preeminent importance to our science that we should become clear about the causal connections between goods. –Carl Menger, Principles of Economics. A Reader asked about why I should be bullish about stocks with inflationary dangers like rising money supply numbers present and the Fed’s zero (0%) interest rate policy. My reply is that I would rather own franchises that can pass along their costs (inflation pass-through) than just a basket of stocks. In severe inflation the goal is to lose less in real terms than holding other assets like bonds. We all lose as a society with rampant inflation, especially the poor and those on fixed incomes. Also, in general, the context in which stocks rise is important. See below. The Stock Market and Inflationary Depression (page 938 in Capitalism by George Reisman—in VALUE VAULT). The same consequence results from the fact that inflation also leads to funds being more urgently required internally by firms—to compensate for all the ways in which it causes replacement funds to become inadequate. At some point in an inflation, business firms that are normally suppliers of funds to the credit markets—in the form of time deposits, the purchase of commercial paper, the extension of receivables credit, and the like—are forced to retrench and, indeed, even to become demanders of loanable funds, in order to meet the needs of their own, internal operations. The effect of this is to reduce the availability of funds with which stocks can be purchased, and thus to cause stock prices to fall, or at least to lag all the more behind the prices of consumers’ goods. When this situation exists in a pronounced form, it constitutes what has come to be called an “inflationary depression.” This is a state of affairs characterized by a still rapidly expanding quantity of money and rising prices and, at the same time, by an acute scarcity of capital funds. The scarcity of capital funds is manifested not only in badly lagging, or actually declining, securities markets but also in a so-called credit crunch i.e., a situation in which loanable funds become difficult or impossible to obtain. The result is wide-spread insolvencies and bankruptcies. Let’s take a step back from what you just read. If you know that money functions as a medium of exchange, then you realize in a modern society that money helps support the specialization of production and hence improves productivity. However, inflation—like dollar bills dropped into the jungle—does not per se increase savings and capital goods (stocks are titles to capital goods). Inflation, if unanticipated, artificially boosts stock prices and then eventually causes a decline because of the limited availability of real capital (bricks, trucks, machines) to reinvest (maintenance capital expenditures) into businesses AND, at the same time, consume consumer goods. In a finite world, you have to choose between mending your fishing nets or fishing to eat; you can’t do both unless you have a cache of fish saved. 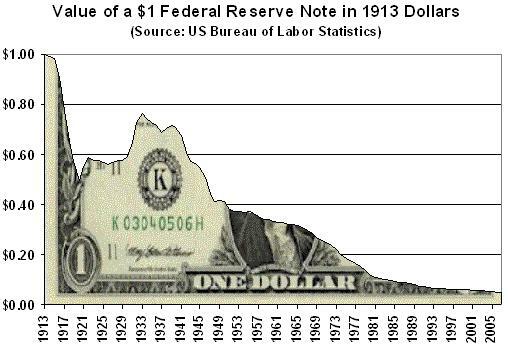 Perhaps in the delusional world of a Federal Reserve bureacrat you can have your fish and eat it too–just print more. Do not blindly believe inflation is “good” for stocks. The article below will help clarify the points made at the beginning of this post. The cause of the business cycle has long been debated by professional economists. Recurring successions of boom and bust have also mystified the lay person. Many questions persist. Are recessions caused by under consumption as the Keynesians would have us believe? If so, what causes masses of people to quit spending all at the same time? Or are recessions caused by too little money in the economy, as the monetarists teach? And how do we know how much money is too much or too little? Perhaps more importantly, are periodic recessions an inevitable consequence of a capitalist economy? Must we accept the horrors associated with recessions and depressions as a necessary part of living in a highly industrialized society? Because the new money enters the market in a manner which is less than exactly proportional to existing money holdings and consumption/savings ratios, a monetary expansion in the economy does not affect all sectors of the economy at the same time or to the same degree. If the new money enters the market through the banking system or through the credit markets, interest rates will decline below the level that coordinates with the savings of individuals in the economy. Businessmen, who use the interest rate in determining the profitability of various investments, will anxiously take advantage of the lower interest rate by increasing investments in projects that were perceived as unprofitable using higher rates of interest. The word “profitable” was undoubtedly put in quotes by Mises because it is a mistake to think that government actions can actually increase overall profitability in the economy in such a manner. The folly of this situation is apparent when we realize that the lower interest rate was not the result of increased savings in the economy. The lower interest rate was a false signal. The consumption/ saving ratios of individuals and families in the economy have not necessarily changed, and so the total mount of total savings available for investment purposes has not necessarily increased, although it appears to businessmen that they have. Because the lower interest rate is a false indicator of more available capital, investments will be made in projects that are doomed to failure as the new money works its way through the economy. Capital-intensive industries are hurt the most under such a scenario, because small changes in interest rates make a big difference in profitability calculations due to the extended time element involved. The fact that it takes time for the increase in the money supply to affect the various sectors of the economy causes the malinvestments which result in what is known as the business cycle. Professor Roger Garrison has noted another way that government policy causes distortions in the economy by falsifying the interest rate.6  In a situation where excessive government spending creates budget deficits, uncertainty in the economy is increased due to the fact that it is impossible for market participants to know how the budget shortfall will be financed. The government can either issue more debt, create more money by monetizing the debt, or raise taxes in some manner. Each of these approaches will redistribute wealth in society in different ways, but there is no way to know in advance which of these methods will be chosen. One would think that this kind of increase in uncertainty in the market would increase the risk premium built into loan rates. But these additional risks, in the form of either price inflation or increased taxation are borne by all members of society rather than by just the holders of government securities. Because both the government’s ability to monetize the debt and its ability to tax generate burdens to all market participants in general rather than government bond holders alone, the yields on government securities do not accurately reflect these additional risks. These risks are effectively passed on or externalized to those who are not a part of the borrowing/lending transactions in which the government deals. The FDIC, which guarantees deposit accounts at taxpayer expense, further exacerbates the situation by leading savers to believe their savings are risk-free. For our purposes here, the key concept to realize is the important function of interest rates in this whole scenario. Interest rates serve as a regulator in the economy in the sense that the height of the rates helps businessmen determine the proper level of investment to undertake. Anything in the economy that tends to lower the interest rate artificially will promote investments in projects that are not really profitable based upon the amount of capital being provided by savers who are the ones that forgo consumption because they deem it in their best interest to do so. This wedge that is driven between the natural rate of interest and the market rate of interest as reflected in loan rates can be the result of increases in the supply of fiat money or increases in uncertainty in the market which is not accurately reflected in loan rates. The manipulation of the interest rate is significant in both cases, and an artificial boom and subsequent bust is inevitably the result. Changes in the supply of money in the economy do have an effect on real economic activity. This effect works through the medium of interest rates in causing fluctuations in business activity. When fiat money is provided to the market in the form of credit expansion through the banking system, business firms erroneously view this as an increase in the supply of capital. Due to the decreased interest rate in the loan market brought about by the fictitious “increase” in capital, businesses increase their investments in long-range projects that appear profitable. In addition, other factors as well can cause a discrepancy between the natural rate of interest and the rate which is paid in the loan market. Government policies with regard to debt creation, monetization, bank deposit guarantees, and taxation, can effectively externalize the risk associated with running budget deficits, thus artificially lowering loan rates in the market. For a detailed discussion of the phenomenon of interest and the corresponding relationship to the business cycle, see Ludwig you Mises, Human Action, 3d rev. ed. (Chicago: Contemporary Books, 1966), chapters 19-20; Murray N. Rothbard, Man, Economy, and State (Los Angeles: Nash Publishing Corporation, 1970), chapter 6 in Value Vault; and Mark Skousen, The Structure of Production (New York: New York University Press, 1990), chapter 9. Friedrich A. Hayek, Prices and Production, 2d ed. (London: George Routledge, 1931; Repr. New York: Augustus M. Kelley, 1967), p. 11. Ludwig von Mises, The Austrian Theory of the Trade Cycle (Auburn, Ala,: The Ludwig von Mises Institute, 1983), pp. 2-3. Rothbard, Man, Economy, and State, p. 857. Richard Ebeling, preface to The Austrian Theory of the Trade Cycle by Ludwig von Mises, Gottfried Haberler, Murray N. Rothbard, and Friedrich A. Hayek (Auburn, Ala.: The Ludwig von Mises Institute, 1983). Roger W. Garrison, “The Roaring 20s and the Bullish 80s: The Role of Government in Boom and Bust,” Critical Review 7, no. 2-3 (Spring-Summer 1993), pp. 259-276. Here is an investor who has the guts to put his work in the public domain. This is one way to track your thinking and investment progress. For those who want to dig deeper, here are notes on Competition Demystified from an “Austrian” Value Investor.